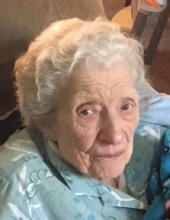 VERRETTE, Kathleen Annabelle -- Age 95, of Byron, died September 13, 2018. Funeral services will be held 1 PM Sunday September 16 at Sharp Funeral Homes, Linden Chapel, 209 E. Broad Street, Linden. Burial at Byron Cemetery. Visitation will be 10AM until time of service Sunday at the funeral home. Those desiring may make contributions to Byron Community Scholarship Fund. To send flowers or a remembrance gift to the family of Kathleen Annabelle Verrette, please visit our Tribute Store. "Email Address" would like to share the life celebration of Kathleen Annabelle Verrette. Click on the "link" to go to share a favorite memory or leave a condolence message for the family.